The first few minutes of Final Fantasy XV represent possibly the best opening to any video game ever made. No, not that ridiculous flash-forward sequence to a near-future battle with a giant demon, where Noctis suddenly has big-boy facial hair. Not that bit where he says goodbye to his dad, either. Those parts are rubbish. The real opening—where the game actually begins, the prince and his three bodyguards sitting on the side of the road with their fancy, broken-down car—is a meticulously constructed masterstroke, cheekily rewriting the DNA of the JRPG, open worlds and video game pacing in general. All four main characters are instantly introduced and with just a few seconds on screen their roles and personalities are neatly summarised. 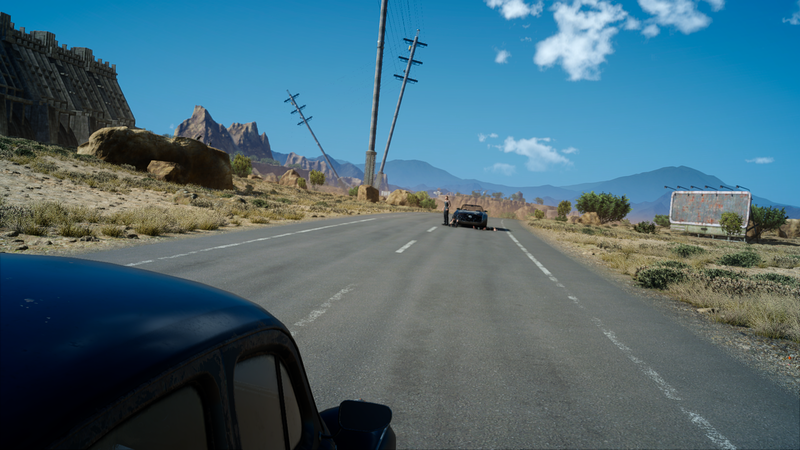 Visual cues like Ignis’ position as the driver, or Prompto lying prone, immediately connect us to them as three-dimensional people who do things not because it’s mandated by the plot, but because it’s who they are. The car is introduced as well. The Regalia. Simultaneously the game’s most important location and most endearing secondary character. Vitally, it contains the themes, motifs and attitudes players will become familiar with over the dozens of hours that follow. Four friends pushing a car down the road tells you everything you need to know about Final Fantasy XV‘s intended experience and design. There’s no need to rush, it says. Take your time. Before anything else substantial happens, we’re presented with the car; the metaphorical freedom of the open road, the means of transportation, a very literal way to move the plot forward. And it’s broken. You, the player, need to physically shift the Regalia with your own two thumbs, and even then it takes all of the characters working together to make any progress. Soon enough, you’re confronted with not an enemy, or a battle, but a song. Florence and the Machine’s cover of Stand By Me begins to swell softly in the background as Noctis and his pals banter back and forth. There’s a desire to believe they will eventually get the car started again, that we’ll find a way to get back to the action. Instead, the song takes over entirely, and the camera pulls out to show exactly how little progress has been made. The game’s title appears over a desert highway, with barely a hint of civilisation in sight. Your next stop is a garage, where the party are quickly told that their vehicle is Out of Service, but that they’re welcome to help out with a few minor tasks until repairs are done. Wait. Slow down. A little later, Noctis finds out his father has been killed and the Crown City of Insomnia taken over; the crew immediately cancel their journey to the wedding in Altissia so they can return home. On that approach, they find the city occupied and, again, are forced to turn around. Eventually Noctis learns that he needs to seek out not only the many magical weapons of his royal ancestors, but also the aid of several gods, which will require pit stops and detours around several continents. Stop. Turn around. Prepare. Plan. When the open world of XV is handed to players, there’s a markedly different feeling to it; most video game sandboxes try to impress upon you the sheer size of the map and the many and varied activities to take part in, but here the reveal is sedate and matter-of-fact. There’s this big, beautiful world to explore, sure, but your goal is small and mundane, and there are few distractions along the way. Your car is unavailable when you first step out, so you need to jog over there, an act which very specifically takes a fair bit of time, letting every player gradually learn the area and appreciate the serene details of the environment. Noctis: The map said Hammerhead was right there. Gladio: Looks that way… on a map of the world. These newly expanded areas aren’t packed with side quests, NPCs or ‘content,’ as such, they’re mainly designed to be areas that you pass through on your way from A to B. But their purpose extends beyond realism—which is a sort of boring, directionless goal anyway—and interacts with other pieces of the new machine XV is building. Campsites scattered liberally around the wilderness provide a place to sit, cook dinner and allow the passing of time; landmarks like odd rock formations or memorable forests act as navigation points as you become increasingly knowledgeable about the different areas; fishing spots let you fish, because fishing is cool (in video games) and Noctis has a good time. None of this is worth a damn without the boys, of course. You could, in fact, argue that a lot of these open-world scraps are poor additions when you just want to throw fireballs at dragons. But all of it comes together so players are motivated and able to learn more about the four main characters. It takes a long time to walk from point to point not to make the world seem large—if anything, returning so frequently to the same places makes it appear smaller—but to give you time with Noctis, Prompto, Ignis and Gladio. To endear them to you. Dialogue between the four is designed to trigger often, and it only takes a handful of missions before players have been exposed to their hopes, dreams, fears and opinions about bugs. Camping sites provide access to stat boosts and are required for levelling up, a decision which pushes you to use them often, until, before you know it, you’re actually camping so you can see how unnecessarily gorgeous Ignis’ burger and chips looks, or to watch Prompto fall over while attempting to act out a joke. Characters play games on their cell phones when stopping at local caravans. 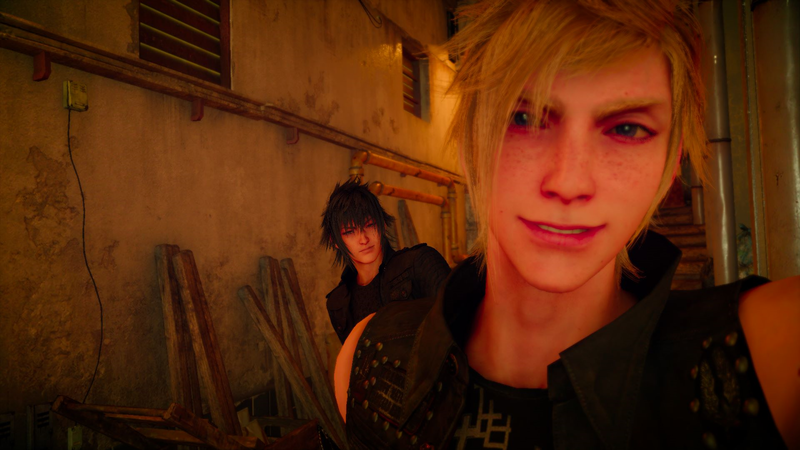 The game’s much-lauded photo mechanic, where Prompto snaps candid pictures of your daily activities and then shows the results during the next rest break, is a genius example of this kind of empathy building process. Where the photo modes in other games are all about capturing the beauty (or ridiculousness) of a crafted universe, XV puts control in the hands of an in-world photographer and lets their imaginary imagination run wild with selfies, action shots, awkward NPC poses and group shots straight from a holiday scrapbook. We get to see the characters unfiltered—apart from the occasional Instagram-style option—and acting naturally. Having fun. Even browsing the pictures themselves is framed as a communal activity between lifelong friends, the quartet members chiming in to say how good or bad a photo might be. For just a moment, they stop being video game characters and start being people. And our in-built human desire to empathise with anything that seems to have feelings does more work than a hundred scripted pages of epic battles and dramatic plot twists. Final Fantasy XV‘s filmic inspiration—the road movie—has clearly been stitched into the DNA of the game. Road films often depict characters isolated by circumstance and distanced from normal society, people who manage to develop complex relationships in the confines of their vehicle as the outside world flashes past. Nods to the genre, like an obsession with the idea of ‘the car’ as a sort of vital artifact, and the many American-style diners visited as the trip unfolds, further reinforce the concept of the journey being more important even than the explosive political intrigue of the overarching story. This is a road trip first, and an epic quest second. Dozens of other small touches push the idea that this particular Final Fantasy is all about stopping to smell the roses. Teammates will shout for Noctis to double back and look at something in the environment they thought was kind of neat; requests are made for you to make random stops on the road to take landscape photos or examine something inconsequential; driving for even a short period cycles everyone through an adorable series of idle animations that only a literal monster would try to interrupt; night adventures are discouraged by the presence of powerful demons, which, combined with the experience system that requires visiting a rest spot, impresses upon players a real sense of time passing. Early acts in the narrative of XV are mercifully congruent with this relaxed style. It’s clear early on that Prince Noctis is being hunted, and they are a mere four people, meaning that rushing in to save the day is out of the question. There’s none of the guilt that often plagues adventurers seeking side stories while the villains burn entire kingdoms to dust in their absence. Unfortunately, the story does inevitably pick up speed and force you more and more to leave the quiet pleasures of the road so you can assume your heroic duties. Perhaps it’s fitting, in a way, that the game makes you confront the idea of the journey’s end more and more. No road trip lasts forever. Still, it feels strangely new and transgressive to reach the later parts of a large scale fantasy story and find yourself hoping that maybe your car will break down one last time, just so you can sit on the side of the road for a few minutes and chat to your friends.